Want to protect your organization from ransomware? The FBI knows how. 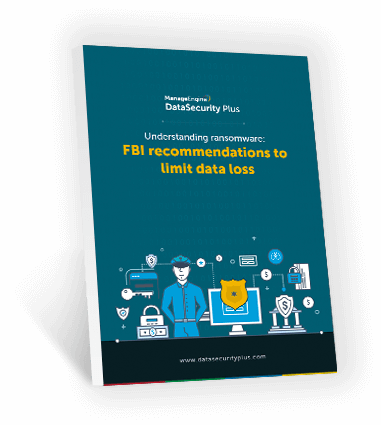 Get a copy of our free e-book and identify measures recommended by the FBI to prevent, stop, and recover from ransomware attacks. What ransomware is and how it spreads. FBI-recommended best practices to prevent ransomware attacks. FBI-approved steps to follow in the event of ransomware infection. Insight into ransomware variants and recent attacks. Latest ransomware trends and what the future of ransomware might look like. You'll also receive a ransomware prevention and response checklist so you'll know where to start with securing your network from ransomware. If you don't see it in your inbox within the next few minutes, check your spam folder. Sign up for a live demo and see how DataSecurity Plus' file auditing and data discovery capabilities provide visibility into what's happening to your sensitive data.